The Wachowski's fantasy epic will hit Blu-ray in May. 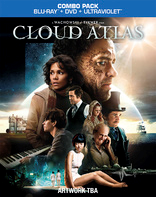 In an early announcement to retailers, Warner Brothers will be bringing 'Cloud Atlas' to Blu-ray on May 14. Past. Present. Future. Everything is connected. From the creators of The Matrix trilogy and the director of Run Lola Run comes an exploration of how the actions of individual lives impact one another in the past, present and future. As one soul is shaped from a killer into a hero, an act of kindness ripples across centuries to inspire a revolution. The story is a time-shifting weave of six interlinking narratives, with diverse settings from the savagery of a Pacific Island in the 1850s to a dystopian Korea of the near future. The Blu-ray/DVD combo pack will feature 1080p video, a DTS-HD Master Audio 5.1 soundtrack, and supplements include: A Film Like No Other; Everything is Connected; Spaceships, Slaves & Sextets; The Bold Science Fiction of Cloud Atlas; The Impossible Adaptation; The Essence of Acting; and Eternal Recurrence: Love, Life, and Longing in Cloud Atlas. Suggested list price for the Blu-ray/DVD combo pack is still undetermined at this time. You can find the latest specs for 'Cloud Atlas' linked from our Blu-ray Release Schedule, where it's indexed under May 14.